Windows application with user friendly GUI (Graphical User Interface) that converts Microsoft Visual Studio Setup and Deploy projects (.vdproj), InstallShield Limited Edition projects (.isl) and Advanced Installer Projects (.aip) into NSIS (.nsi) and Inno Setup scripts (.iss). Application is present in newer packages of Graphical Installer (the same version): Graphical Installer for NSIS and Graphical Installer for Inno Setup and also in Visual & Installer and RAD & Installer. 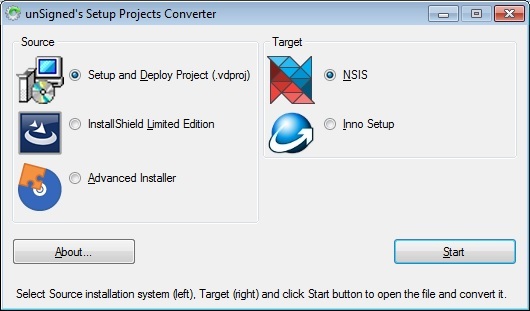 Tip: With this tools you can convert your existing installer into NSIS or Inno Setup really fast and easily! It is a modern Windows application with intuitive and user friendly GUI and it is suitable for inexperienced users too. Start the application if it is not running - by clicking its icon in Start menu or directly by launching it. (The application is located in Graphical Installer installation directory - Inno Setup 5\Graphical Installer). Main window opens. Step #2: Select Target installation system on the right. Choose either NSIS or Inno Setup. Step #3: Click the Start button. Open file dialog appears. Choose a (source) file you want to convert (into target). Only supported extensions are shown in this dialog (they are marked in bold in step #1). Step #4: Application is now processing the source and converting it to target. Progress of this operation is shown in separate window. - When conversion is finished new files (either .nsi or .iss script file) are created in the source folder and content of this folder is shown in Windows explorer. - If any error appears the progress window stays open and no files are created. - Please remember: not all features can be converted into NSIS or Inno Setup and you may need to adjust the resulting script file manually. Tip: Use your preferred NSIS or Inno Setup editor to open and compile the generated script files. We recommend you to use Visual & Installer or RAD & Installer for an easy way of creating and editing script files. These tools provide a lot of functionality (like syntax highlighting, word completion, ...) which can resolve many errors occurring during development.